Pope Francis baptizes a baby at the Vatican, Sunday, Jan. 7, 2018. Image via AP. If you were planning on asking the pope’s permission to breastfeed, you don’t have to, because the answer is an emphatic screaming-from-the-rooftops YES, sí, oui, ja, はい, 是, every God blessed language in the world, please, willkommen. This Sunday morning, in the annual mass baptism in the Sistine Chapel, he expressly encouraged breastfeeding at least the fifth time. He told the congregation: “Today the choir will sing but the most beautiful choir of all is the choir of the infants who will make noise. It came after Pope Francis said in an interview last month that mothers should not feel uncomfortable breastfeeding during his ceremonies. 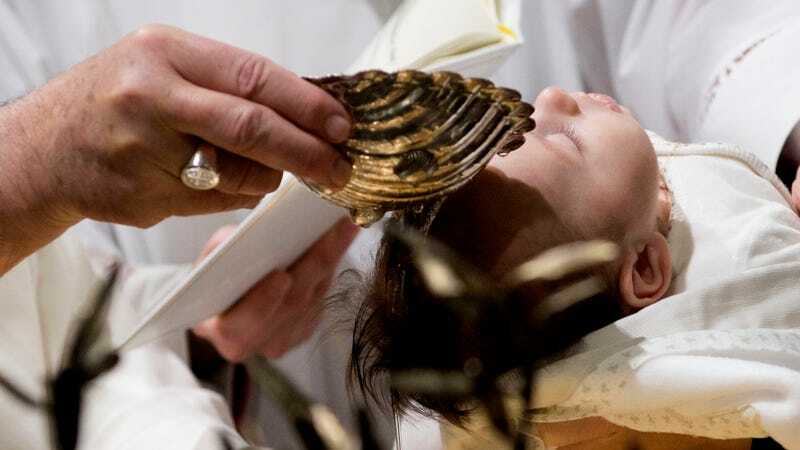 Pope Francis baptized 33 infants in the Sistine Chapel on Sunday and told the mothers to feel free to breastfeed them if they cried or were hungry. “You mothers give your children milk and even now, if they cry because they are hungry, breastfeed them, don’t worry,” he said, departing from his prepared text. The written text of his homily had the phrase “give them milk,” but he changed it to use the Italian term “allattateli”, which means “breastfeed them,” and added that they should not hesitate. As the sounds of crying grew louder, the Pope joked that the concert had begun. The babies are crying, he said, because they are in an unfamiliar place, or because they had to get up early, or sometimes simply because they hear another child crying. Jesus did just the same, Pope Francis said, adding that he liked to think of Our Lord’s first sermon as his crying in the stable. “And if your children are crying because they are hungry, the Pope told the mothers present, then go ahead and feed them, just as Mary breastfed Jesus. For context, the Vatican has traditionally discouraged breastfeeding; NPR cites one woman’s claim that before Francis in 2012, she was “whisked away by a security guard to the bathroom” for breastfeeding in St. Peter’s Basilica. Catholic Stand has also recently addressed the issue of breastfeeding in church, as has USA Today.